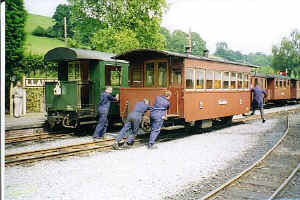 In 1901 construction of the Welshpool & Llanfair Railway started in mid Wales, and passenger service commenced in 1903. Unlike other narrow gauge lines in the region, this 2 foot 6 inch line was not built for the mining industry, but linked the market town of Welshpool to the surrounding rural communities. 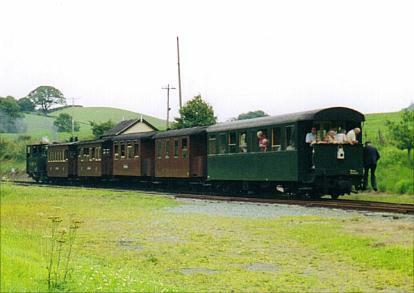 The Cambrian Railway originally operated the line, but it was assimilated into the Great Western in 1923. A freight only operation ensued in 1931, due to lack of profitability of passenger service, and nationalisation into British Rail followed in 1948. The financial situation did not improve and the line was closed in 1956 with, unfortunately, most of the rolling stock being scrapped that year. Fortunately, most of the right-of-way and many of the structures on the original line remained intact. In 1963 the preservationists obtained a lease of the line and started searching for suitable rolling stock. 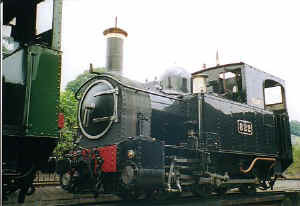 The two principal steam locomotives from the original line, No. 822 and No. 823, had been previously saved. Due to the rare 2 foot six inch gauge, other suitably gauged steam locomotives were sought from around the world. Similarly, four diesel locos were also acquired for support and maintenance trains; and the coaches were acquired from 2 foot 6 inch gauge railroads in western and eastern Europe. A front quarter portrait of No. 823 'The Countess'. As stated previously, with the exceptions of Nos. 822 and 823, the steam traction has been otherwise obtained from abroad. No. 12 'Joan' hails from Antigua and is presently stored out of service at the platform entrance at Llanfair, with her 'jewelery' removed for security. No. 12 'Joan' was built in 1927 by Kerr Stuart and is an 0-6-2. Loco of the day of my visit was one of the original locomotives from the line, No. 823 'The Countess', who celebrated her centenary with a new boiler two years ago. 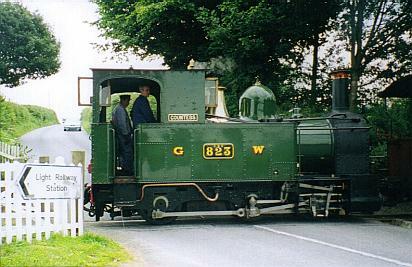 This 0-6-0 was built by Beyer Peacock and finished in GWR livery. No. 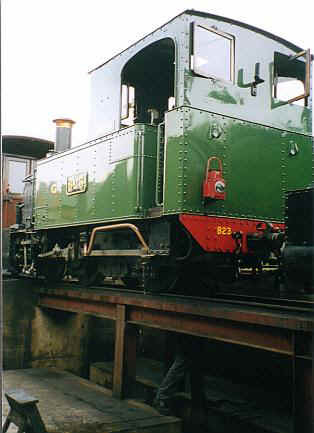 822, 'The Earl', is identical to No. 823 save for the British Rail black livery. No. 823 'The Countess' arrives with the train fron Welshpool. No. 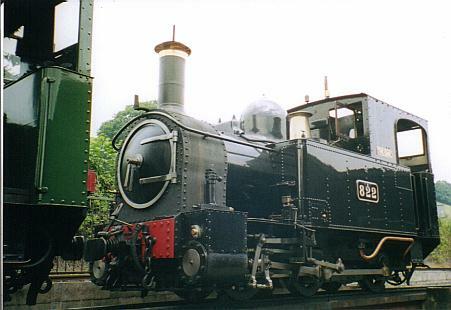 822 'The Earl' is identical to No. 823 save for the British Rail black livery. In addition, a recent arrival is No. 423, an 0-8-0 steam loco named 'Rosita', originally from a Romanian cement works, having been stored in the UK for some years by another railway after being retired abroad. The Welshpool and Llanfair will initially restore her cosmetically and then survey her with a view to return to live steam. Other steam locos owned by the railway include a repatriated Hunslet 2-6-2, No. 14, which was built in 1954 and bought back to the UK in 1975 from Sierra Leone in West Africa, being saved from the torch and a civil war. The loco has worn both a blue and a red colour scheme during her time here, but was not on view at the time of my visit. 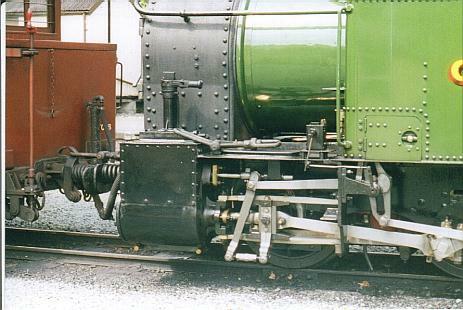 In addition, there is an 0-4-4-0 articulated Mallet which is currently being reassembled after having spent some years dismantled and in store at the Festiniog Railway in Porthmadog. 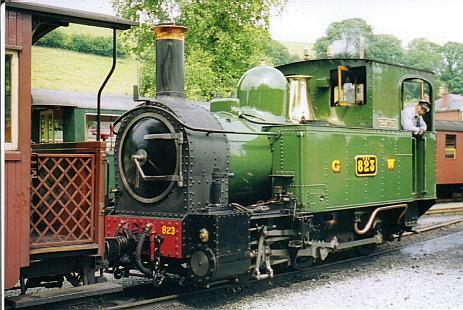 This loco originally worked at a paper mill in Kent, UK and was bought by the Welshpool and Llanfair in the 1960's. 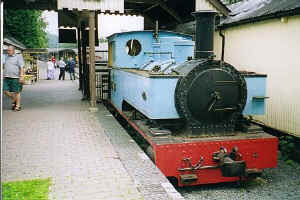 Problems with steaming and other operational issues resulted in the loco being sold to the Festiniog who dismantled it for a rebuild, but a change of plans there resulted in the project being cancelled, with the loco remaining in parts there until being brought back 'home' piecemeal to Welshpool. One of the diesels was recently bought from the Taiwan Sugar Corporation, and shipped to the UK. Named 'Diema', No 175 also carries the unofficial name of 'Ming Orchid' amongst the railway staff, after the name of the ship that bought her here. 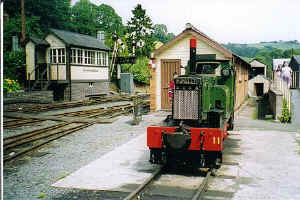 A small Hunslet diesel named 'Ferret' languished in a siding for many years until it was restored by the young members of the railway. A third diesel is in the workshop undergoing heavy maintenance including re-sitting the body on the frame, to improve balancing. No 175 'Diema' stands on the right outside the workshop with 'Scwbi', which translates from the Welsh language into 'Scooby'. 'Ferret' was restored by the young members of the railway. The four wheeler coaches originate from the Zillertal railway in Austria, and their number has increased gradually as funds have become available to purchase more. The railway has generally scoured Europe for suitable rolling stock and has also acquired some ballast wagons from Romania. The train is vacuum braked for safety. The Zillertal coaches have fine detailing including lattice gates on the balconies. A selection of freight wagons including a stock car. Two other coaches on the railway have been obtained from Hungary. These are trucked coaches and have undergone some restoration before being put into service. These definitely have a better ride quality than the four wheelers. The Hungarian trucked coach with popular rear veranda. This is probably the closest you'll get to a business car 'look' in the UK. In addition, in response to considerable demand, the railway recently tendered a contract for a replica coach, to be made of the type originally used on the line before closure. 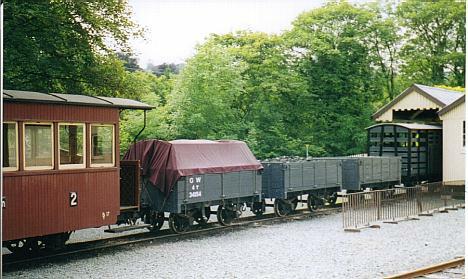 The contract was was won by the narrow gauge Festiniog Railway (who seem to supply much for the regional preserved rail community) and they have just delivered the coach to the railway. The vehicle is a classy piece of work and can be seen at this link. 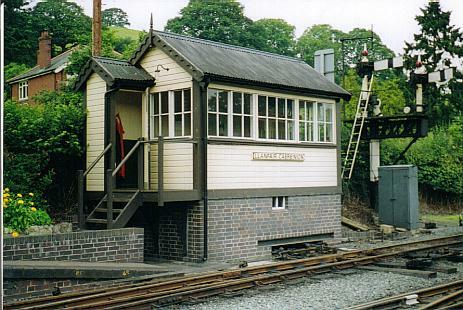 The station buildings and signal box at Llanfair are survivors from the Great Western era, and painted in that line's typical brown and cream colour scheme. The station at the other terminus at Welshpool is a newer structure but still of the same style. The signal box at Llanfair with semaphore signal. Up to the period of State ownership the Welshpool station stood in the middle of the town with the final remaining part of the line running along the roads there. However, due to construction in the town after 1956, that part of the right of way is no longer available. The line in its present form is about eight miles long and a one way journey takes about 50 minutes. 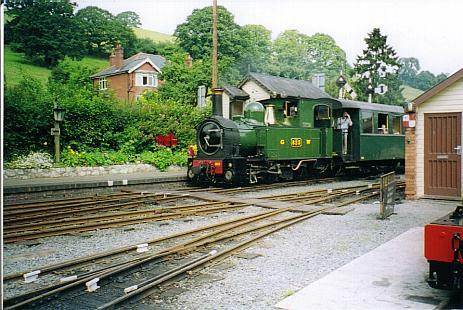 On the day of my visit, upon arrival at Llanfair station, the locomotive had to detach from the train and run round a passing loop for the return journey. However on this occasion, a previous marshalling error had left a four wheeler coach blocking the passing loop. As the coach in question was to be added to the train for the return journey, No. 823 could not simply shunt it away down the shed road. To avoid a diesel being cold started, some railway members were press-ganged into manually shunting the coach into the freight siding to clear the road. With her right of way clear, No. 823 reversed through the loop and then forward down the freight road to couple up to the errant coach. 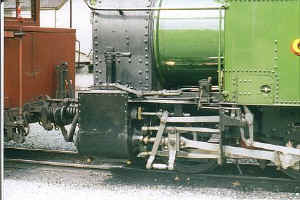 A close up showing the valve gear. After coupling to the coach, No. 823 was coaled manually and then had to reverse down the shed road to be oiled and greased for the return journey. There is a single road shed at Llanfair, with all the maintenance being done here, and just a station building at Welshpool. 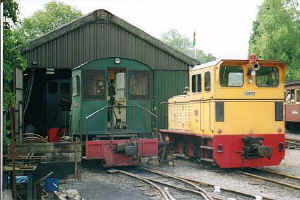 The shed can stable three locomotives. 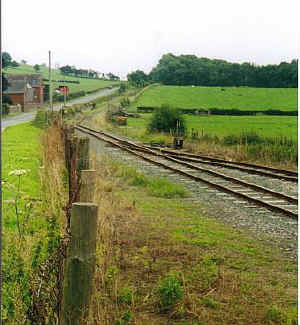 A view looking East from the platform of the shed road with No. 822 'The Earl' standing cold over the inspection pit. No. 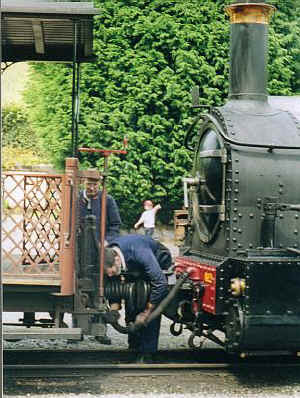 823 'The Countess' receives oil and grease during an inspection. The two locomotives double-head trains at events such as steam galas. After returning from the shed road No. 823 moved forward to join the train. The line is fortunate in that during the recent general downturn, ridership has increased year on year and this train was well patronised, resulting in the extra coach being required. The line has also benefited from being allocated central lottery funding. 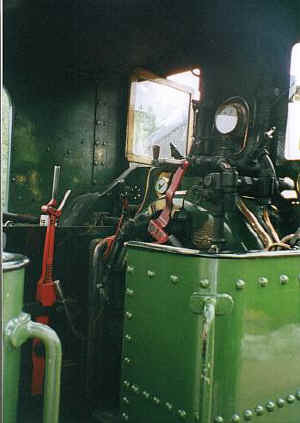 A view of the cab interior of No. 823 not long before departure. 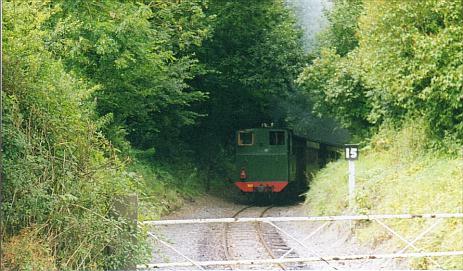 The train departs down the grade for Welshpool, with the line curving to the left. Just after 1 pm the train departed for the return trip Welshpool. After the train had left I drove to the station and grade crossing at Castle Caereinion. The station and crossing are unmanned and the train crew operate the gates. The occasional muffled whistle indicated that the train was catching up with me. 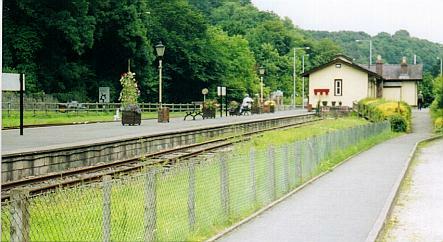 The whole line passes through farmland or leafy countryside. The crossing gate at Castle Caereinion. The speed limit on the line is usually 15 mph as indicated. No. 823 emerges from the foliage and comes to a stand for the crossing gates to be opened. After the gates have been opened and the road traffic pacified, No. 823 reverses over the crossing with cab windows open for ventilation. There are five halts along the line with an occasional passing loop in the event of more than one train running at the same time. 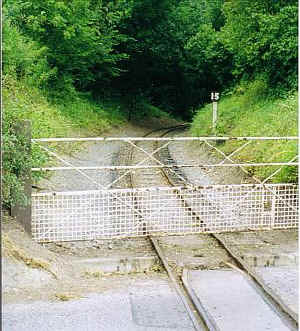 The track is well maintained and the railway has upgraded it with new rail and hardwood sleepers from Brazil. You can alight at one of the Halts and buy your ticket on the train. 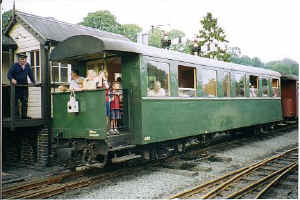 A view of the whole train at Castle Caereinion. The locomotives have to contend with some hard gradients on the line especially on departure from Welshpool station, which at its steepest is 1 in 29; the steepest found in the UK under a steam operation. The right of way runs partly alongside the busy road from Welshpool to Barmouth and Dolgellau. The gradient undulates throughout the length of the line. On reaching Welshpool the locomotive runs around the train again for the next journey. The station is sited next to the main road for easy access and has lots of parking, with a public house on the next plot of land should you wish to have a meal after the journey. Welspool station with the water tower on the right. 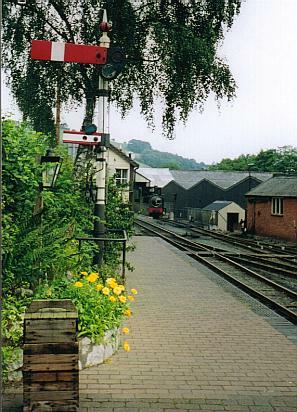 A view from the carpark at Welshpool, showing the platform and bay siding. 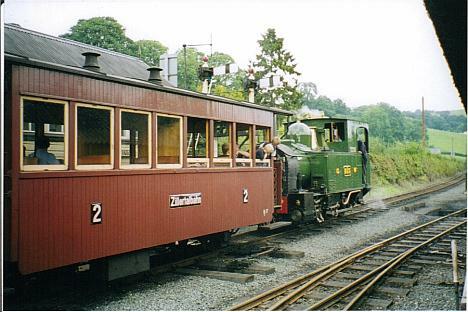 As on other Welsh narrow gauge lines, the standard of maintenance and appearance of the motive power is very high. 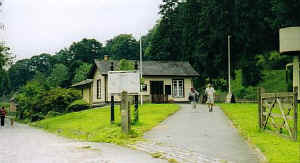 The railway is mostly run by volunteers who have discounted modern accommodation available to them on site, which is owned by the railway. The staff appear to have a united front and good atmosphere when operating the railway, and were tolerant of me lurking by the inspection pit, which was probably off limits. In addition a younger member of the railway appeared at my elbow by the Hunslet diesel out of thin air, and was a mine of mechanical information. Welshpool is served by the State rail network on the Shrewsbury to Cardiff line, and has an airstrip on the other side of the small town, should you wish to rent a King Air up from Heathrow. For further information you can visit their website.